There are floods of ads on TV all the time about taking prenatal vitamins before becoming pregnant. But if you’re like me, and weren’t trying, chances are very high that you haven’t been. And this is OK. When I found out at the doctors at around 6 weeks, the doctor wrote down a vitamin for me to grab on the way out, to start taking once a day, as it’s really important especially in the first 12 weeks to be giving your baby all of these vital nutrients. The two main things that they include higher dosages of than any normal multi vitamin, is folic acid and iron. Both of these vitamins are super important in your babies development in utero. Folic acid helps prevent neural tube defects – serious abnormalities in your babies brain and spine growth. Iron helps with anaemia (as a lot of women would already know, as we seem to be much more iron deficient than men). They also contain other vitamins such as calcium (for bones), and vitamin D. A super interesting fact I found out when I became pregnant came from a friend who is a nurse and fellow mum. She said that lately, a lot of pregnant women especially in the Geelong area have been testing low for Vitamin D, and supplements are being handed out. You will be tested for this a few times during your pregnancy, but taking a supplement never hurts while you await the results. Your body just rejects what it doesn’t need. 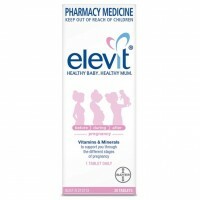 The doctor wrote down Elevit for me to purchase, and so I did – At around $30 RRP and taking one capsule a day, it wasn’t the cheapest thing I had ever purchased, but it’s funny how your brain justifies this quite easily when it comes to the health of your baby over say, a new dress! When I ran out, I was at the supermarket who don’t stock all brands and found Natures Own – After comparing the ingredients, I found it had the same adequate amount of folic acid and iron I needed, and was on sale for $13, reduced from around $17. I find buying my vitamins at the Chemist Warehouses around end up being the absolute cheapest – There are 3 in Geelong – Ryrie Street, Little Malop Street and Westfield and one on the Princes Highway in Corio. Otherwise, all chemists and big supermarkets will stock one of the brands available. What prenatal vitamin did you use?